Zoinks! 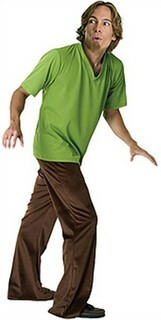 In your Adult Shaggy Costume, you will be the star of your Scooby Doo group Halloween costume. You'll be recognized instantly as the famous lanky cartoon character in this Shaggy outfit, complete with trademark green shirt, brown pants, Shaggy wig and goatee. Dressed as the scaredy-cat better known for his eating habits than for solving crimes, in this Shaggy Halloween Costume, you'll have the perfect excuse to sneak a little extra candy! This Adult Shaggy costume comes in a standard size that fits most adults. Availability: This Scooby Doo Shaggy Costume takes approximately 1 business day to leave the warehouse. Please not: costumes with wigs are not returnable.